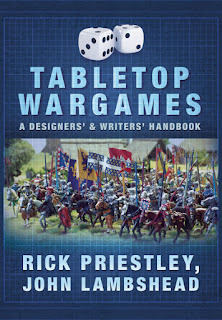 Pen and Sword Books very kindly sent me a copy of Tabletop Wargames: A Designers' and Writers' Handbook for review. 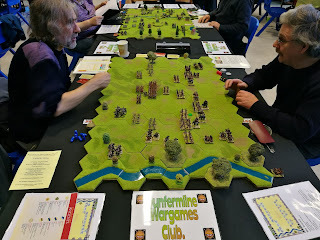 I was very pleased about this as, like a lot of wargamers, I have, over the years, considered putting pen to paper and trying to come up with a set of rules of my own. 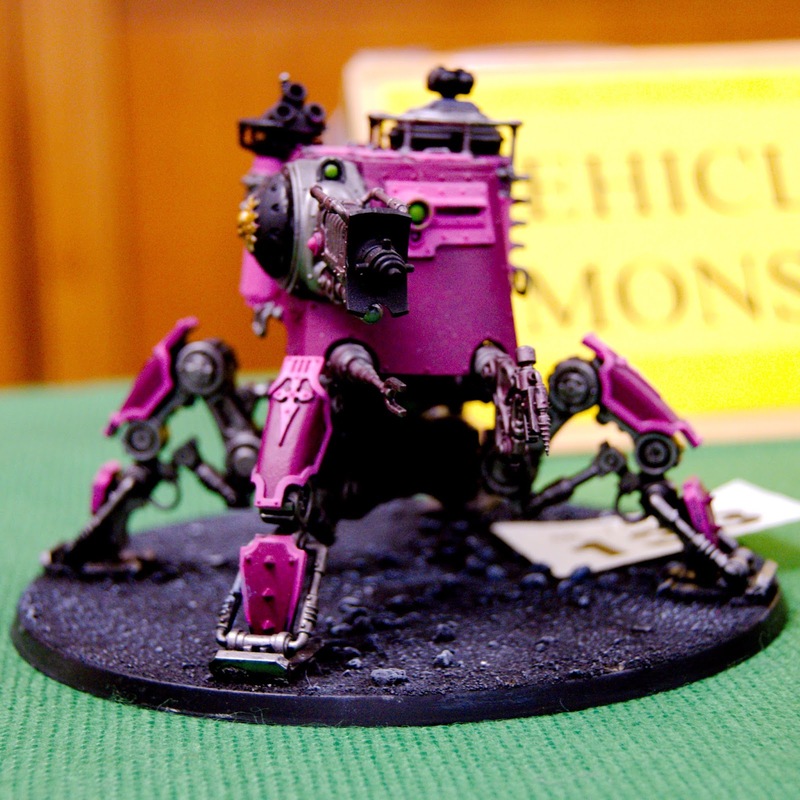 The book is well written and lays down a lot of different aspects of rules writing that need to be considered. 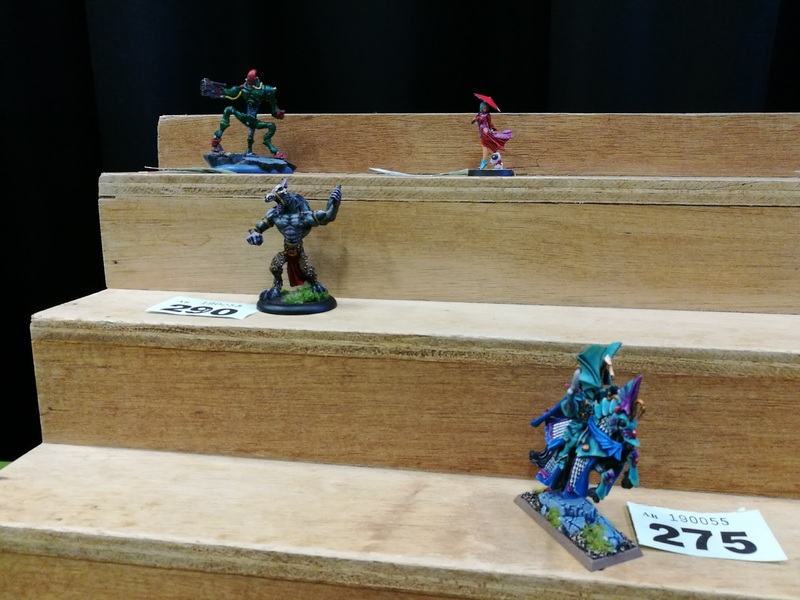 It doesn't go into the nitty-gritty of calculating all the intricate maths needed to balance a game, but it does give a few suggestions on how to approach that. There are times when it becomes apparent that the writers are approaching things from their own experience and guiding rules writers to create similar rules to their style of games, but this is only to be expected and is easy to spot when it happens. The book does get very "wordy" in places, especially when the authors use terms that relate to specific game mechanics design aspects and then combine those into long descriptive paragraphs. 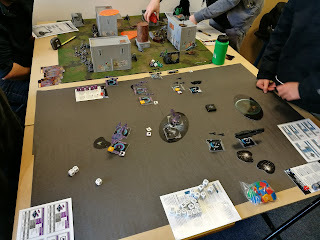 There were several places where I had to read bits two or three times to get my head around them properly. 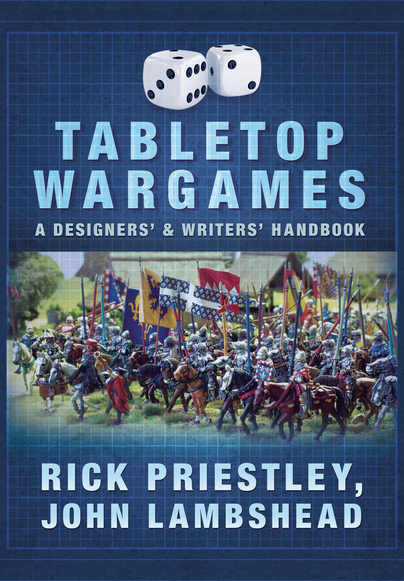 Setting these criticisms aside, the book does quite a good job of explaining the mindset needed for a games designer and also points out some of the less obvious considerations when creating a wargame that is planned for publication. 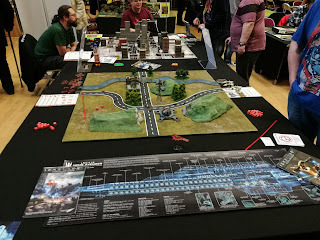 The book is an interesting read for the average player of wargames too, as it gives an insight into the mind of the designer, and answers some of the "Why did he do it that way?" 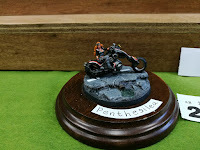 or "What was he thinking?" kind of questions that most gamers have had when reading different sets of rules. 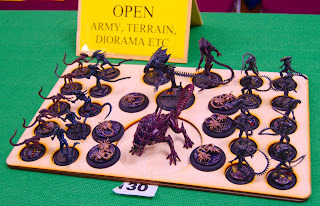 Even if I had not been sent this book to review, I would have ended up buying a copy. 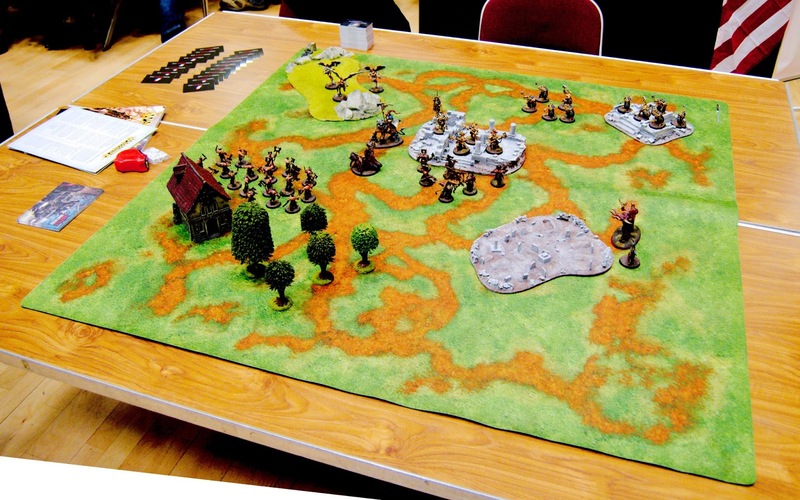 It is a bit wordy in places, but nothing compared to some older rules sets that are out there. 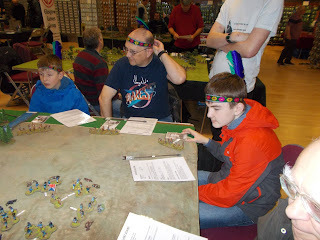 In my opinion, it is well worth a read for both players and rules writers. 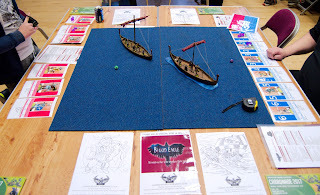 The book can be found at all the usual places, or direct from Pen and Sword. 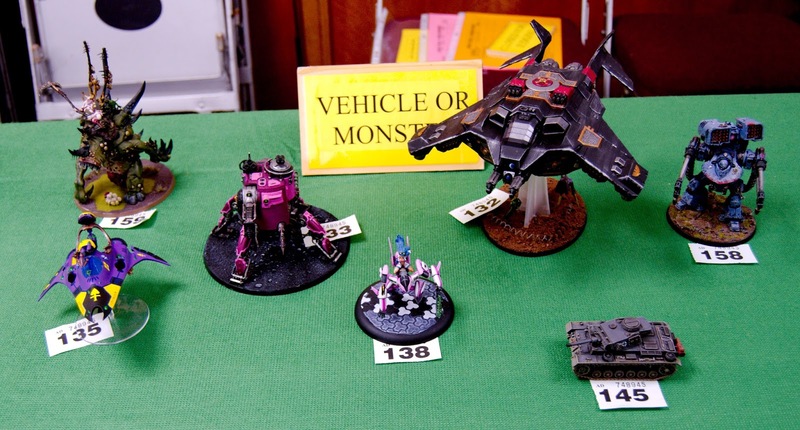 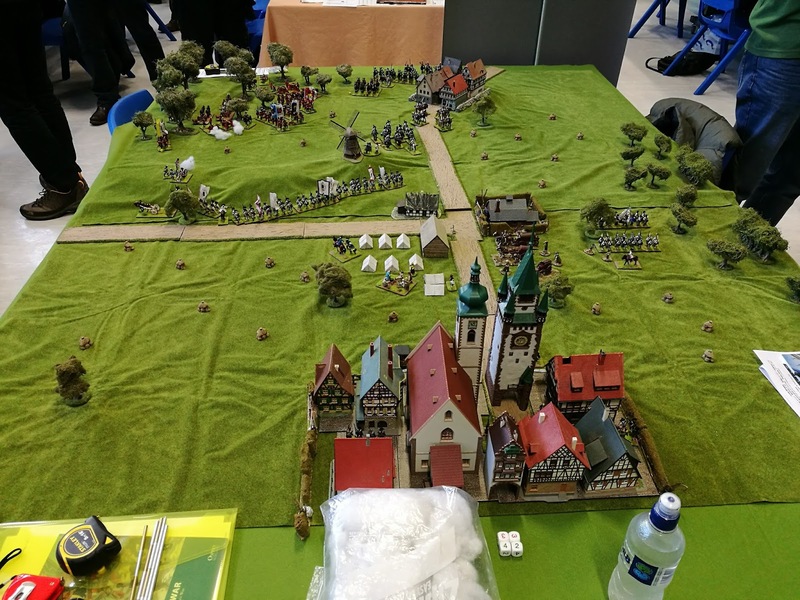 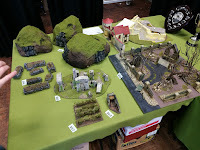 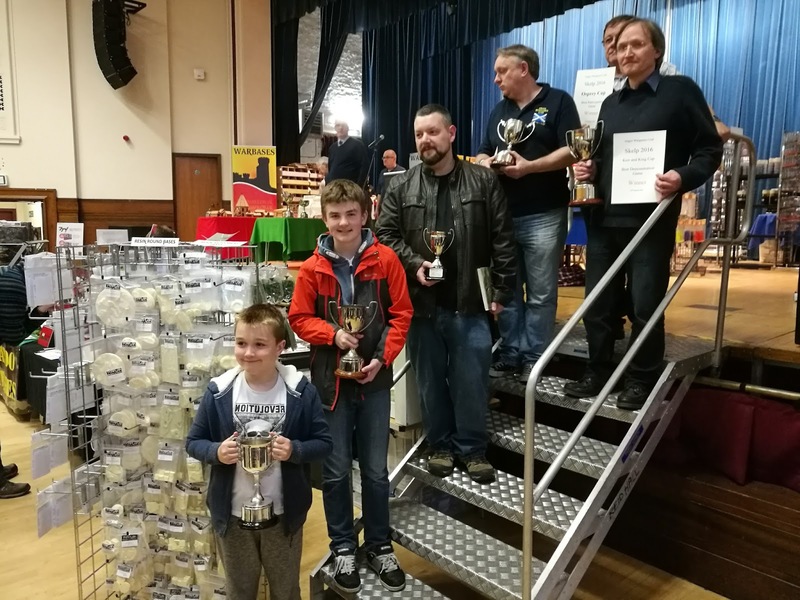 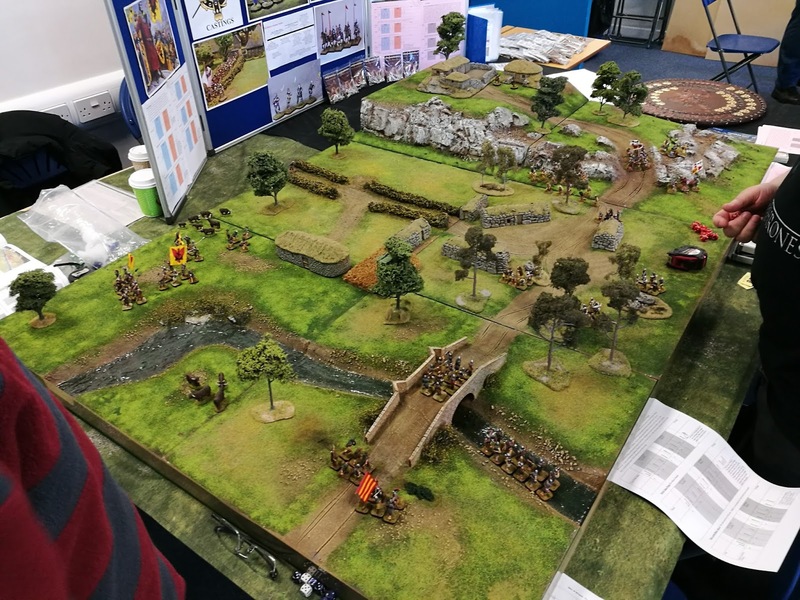 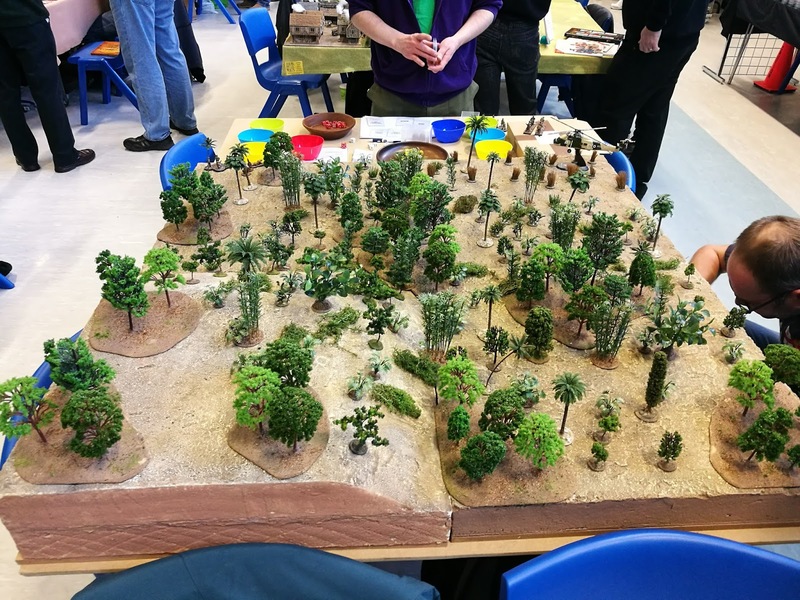 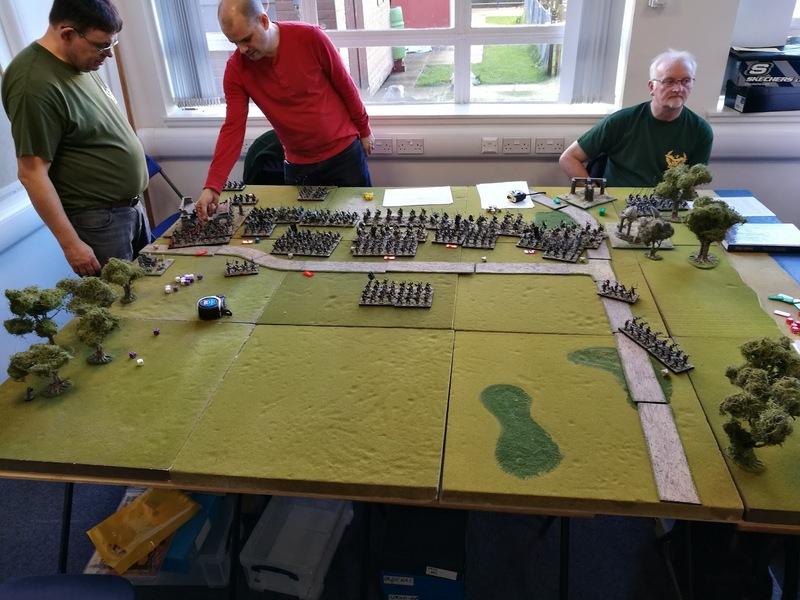 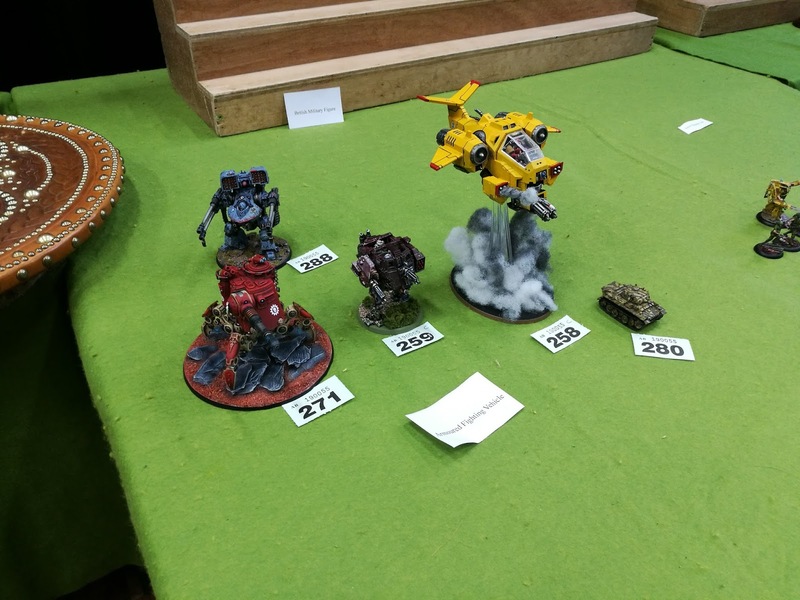 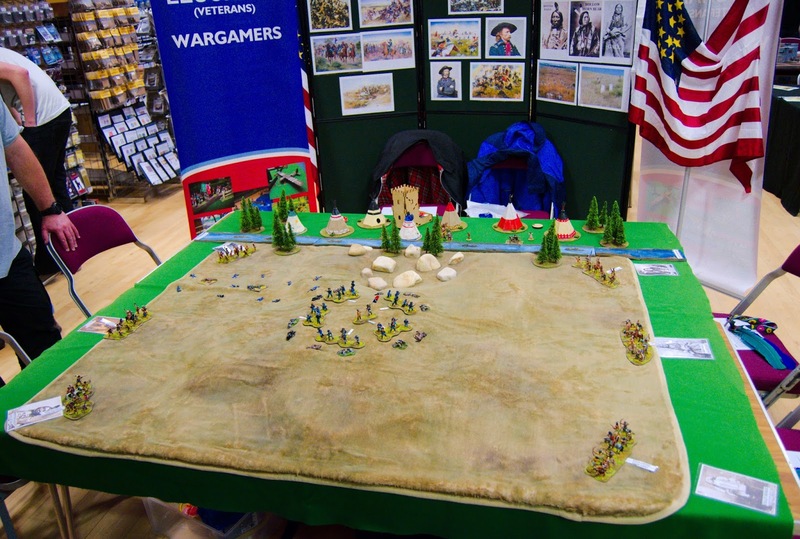 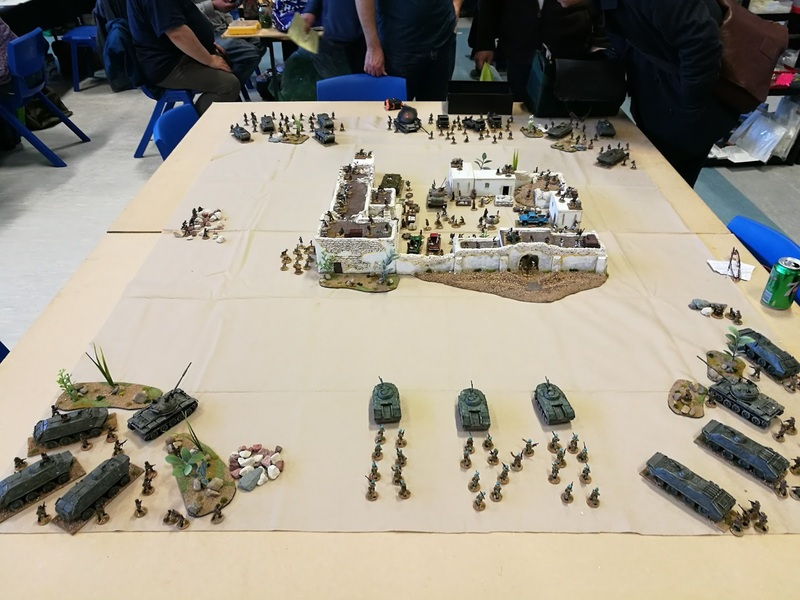 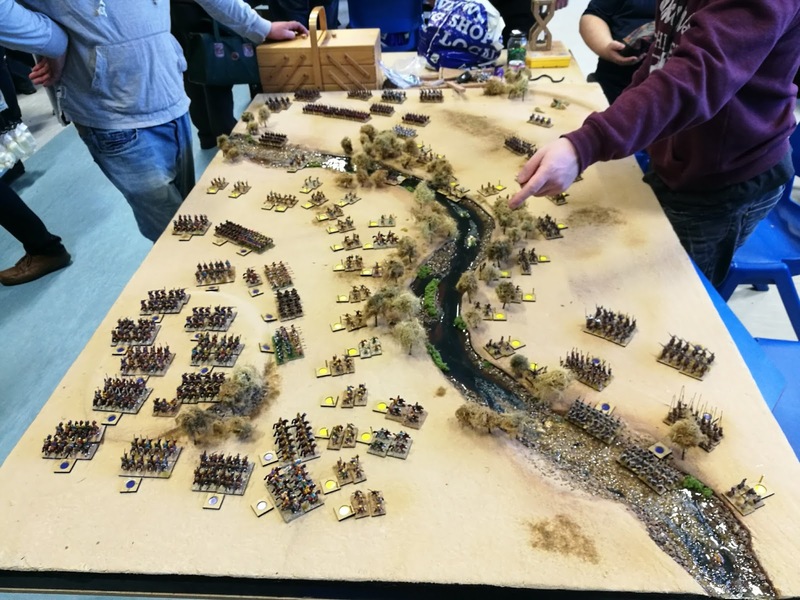 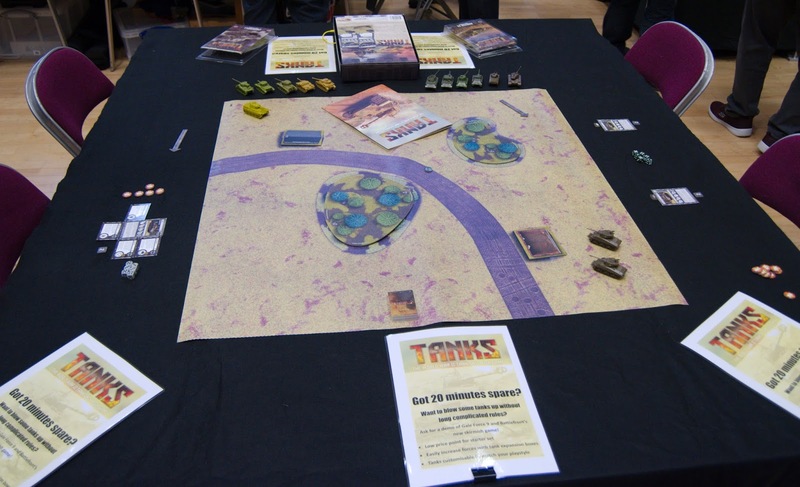 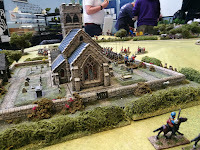 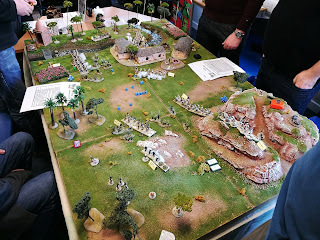 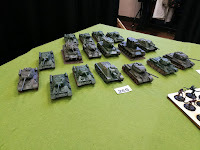 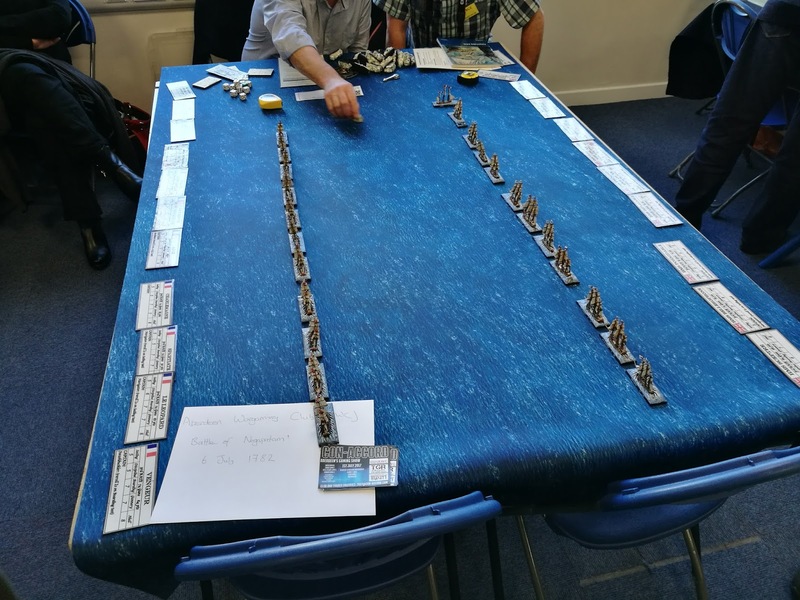 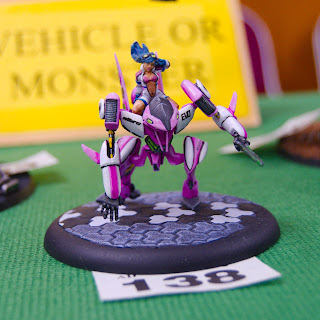 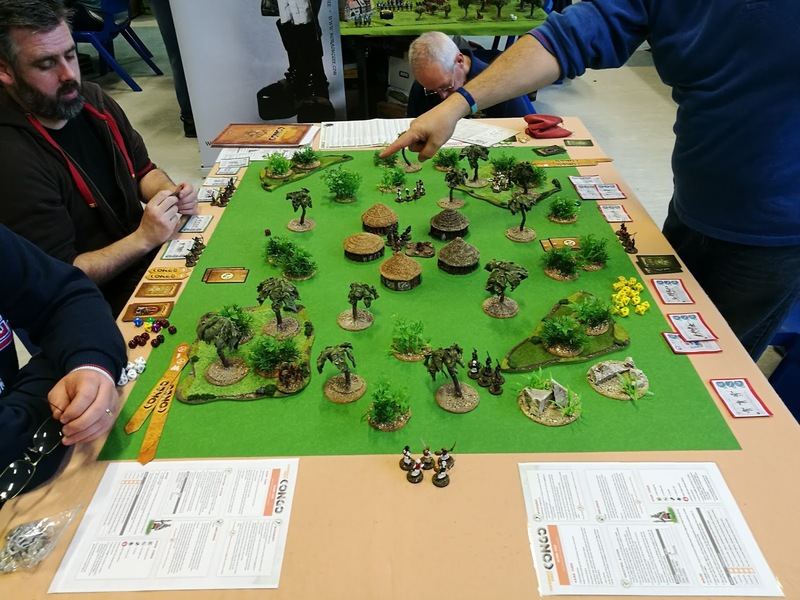 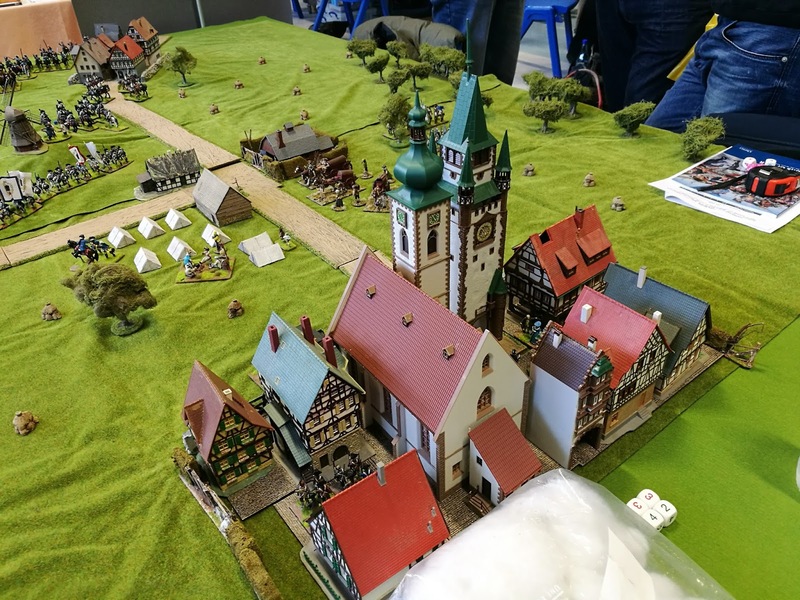 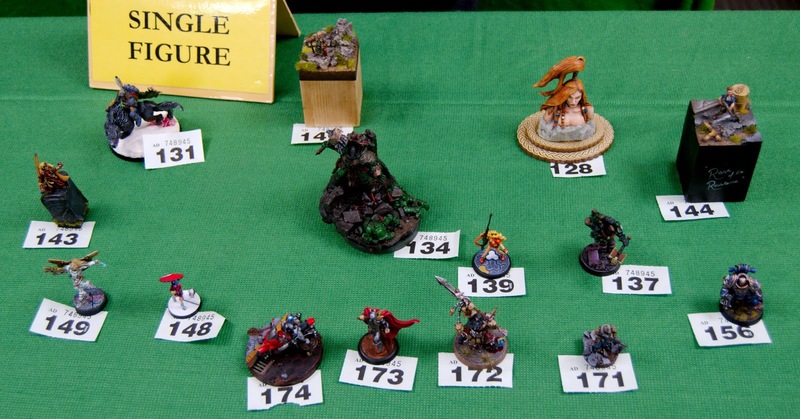 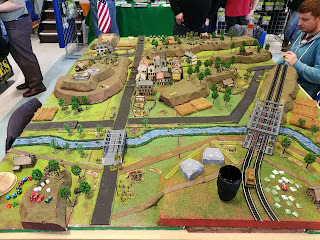 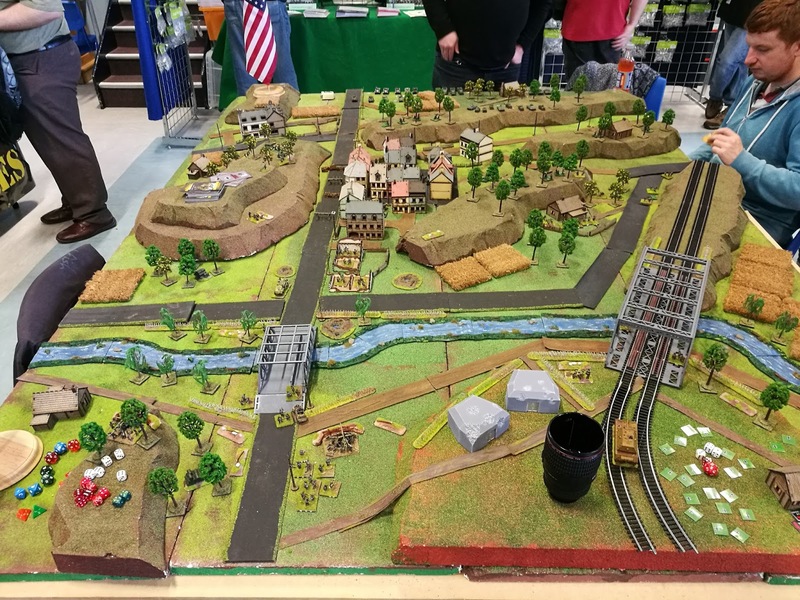 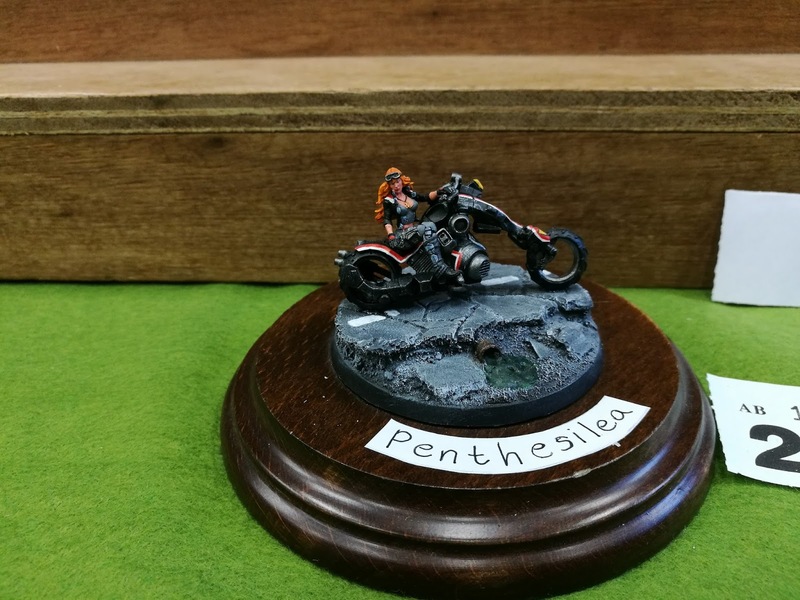 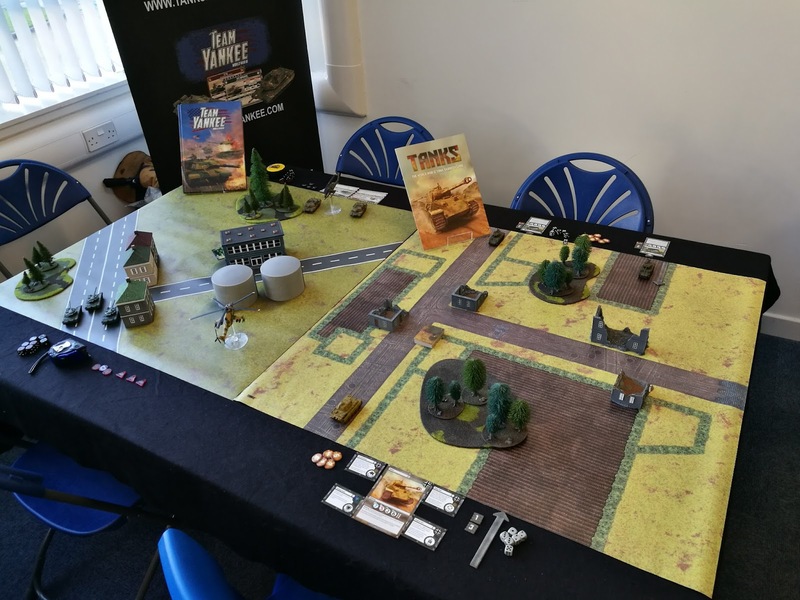 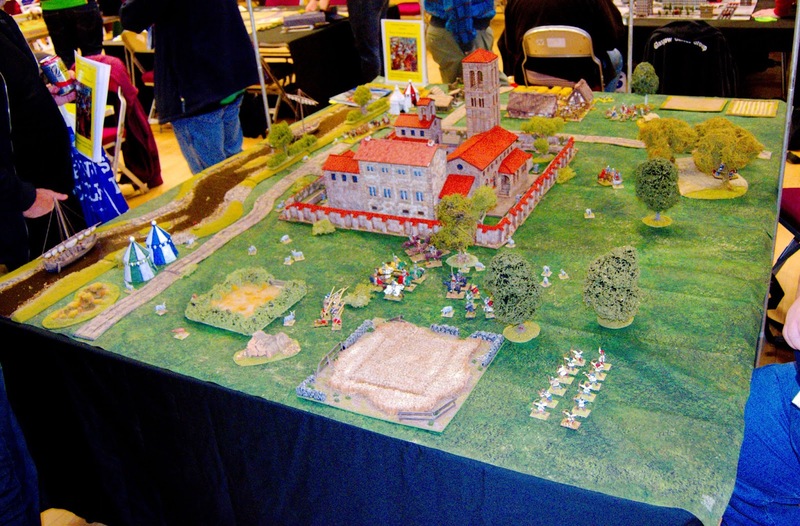 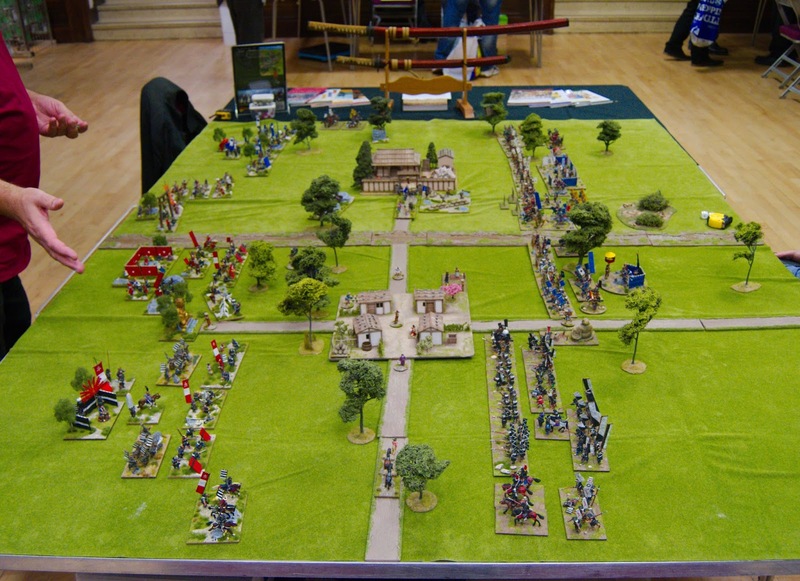 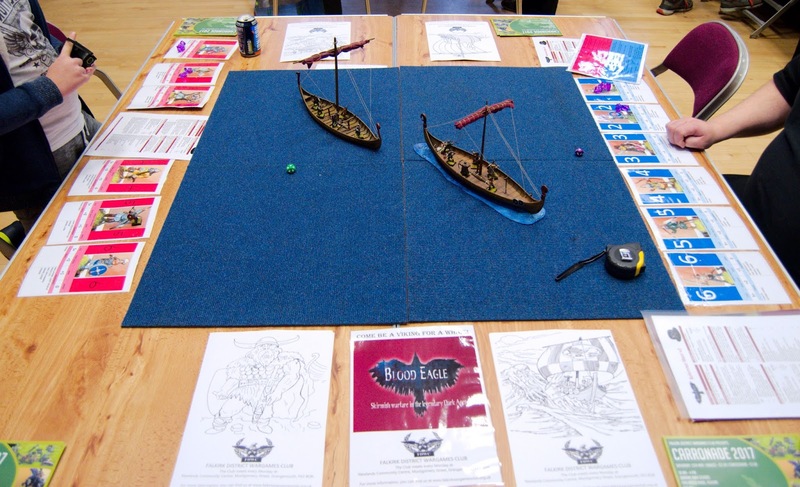 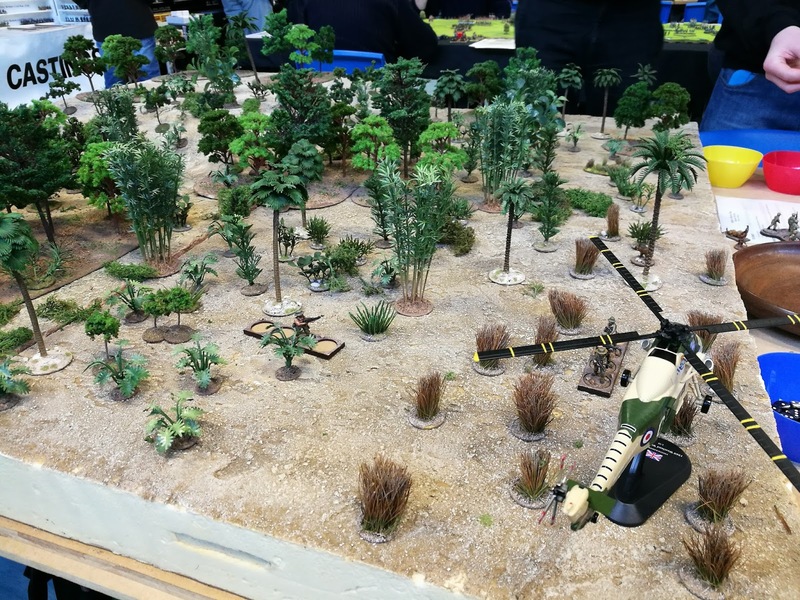 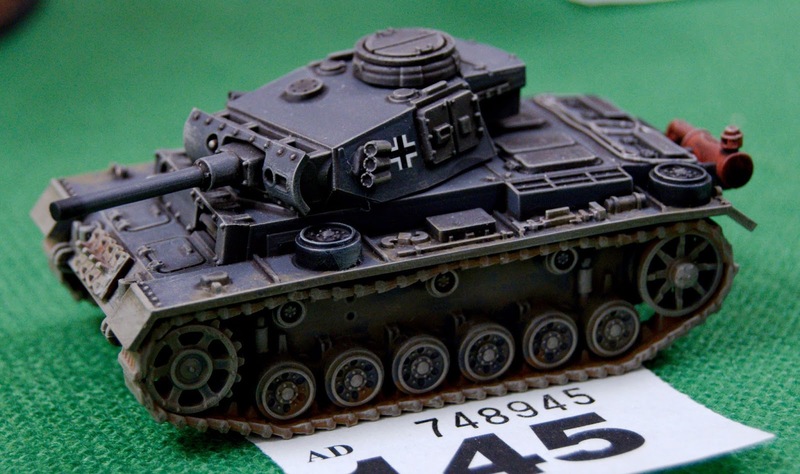 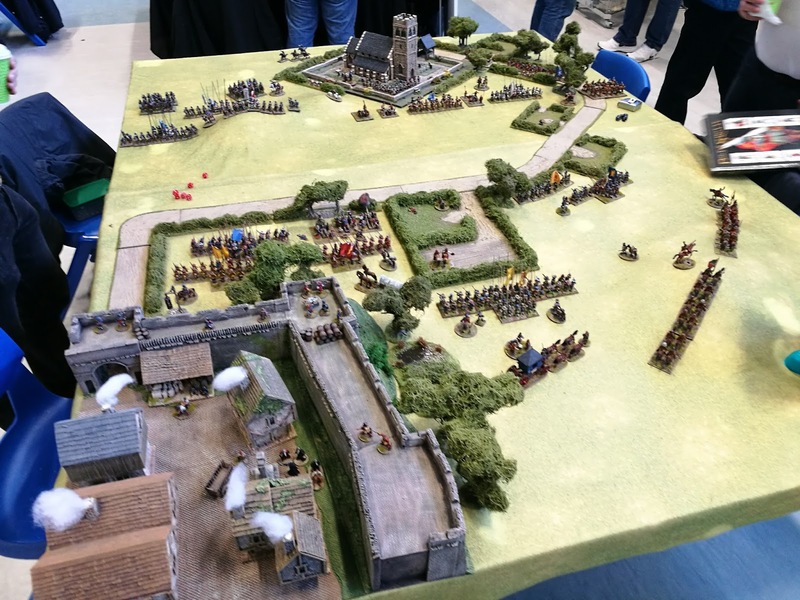 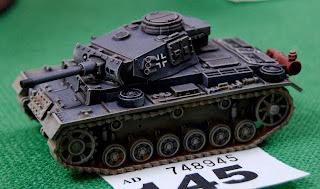 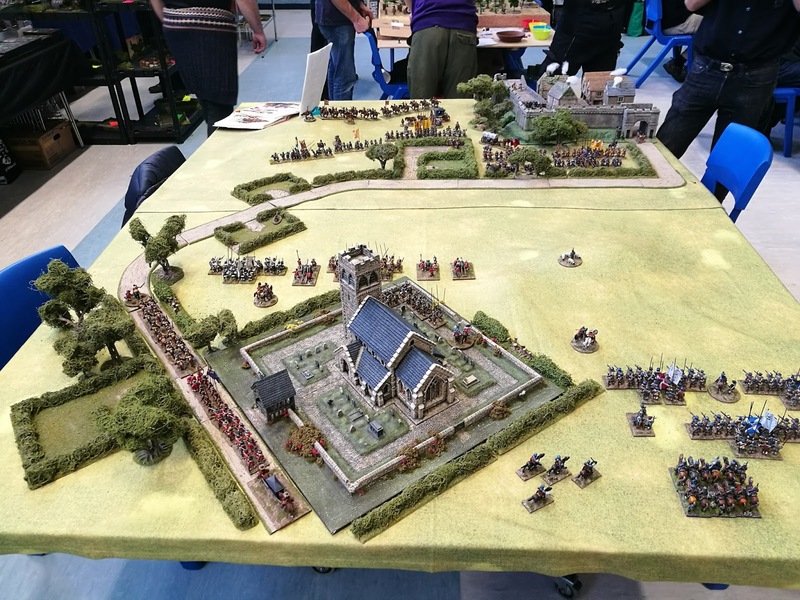 Angus Wargames Club held their annual show, SKELP, over the weekend. 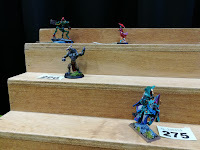 I usually try to support the local shows, so I set off on Saturday morning, along with my gaming pal Jeff Smith and my two sons. The weather was atrocious, with pouring rain for most of the day. 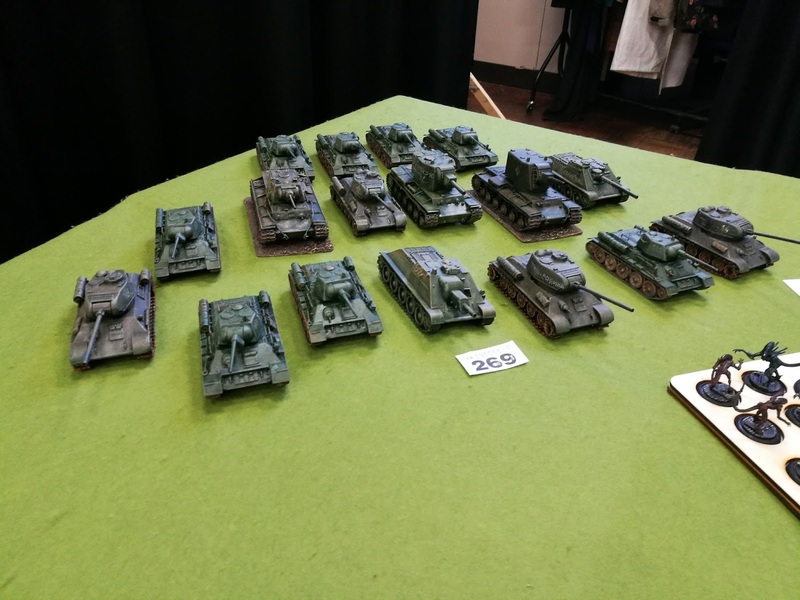 It became apparent that this probably affected the attendance figures for the show (although it has always been a very small anyway). 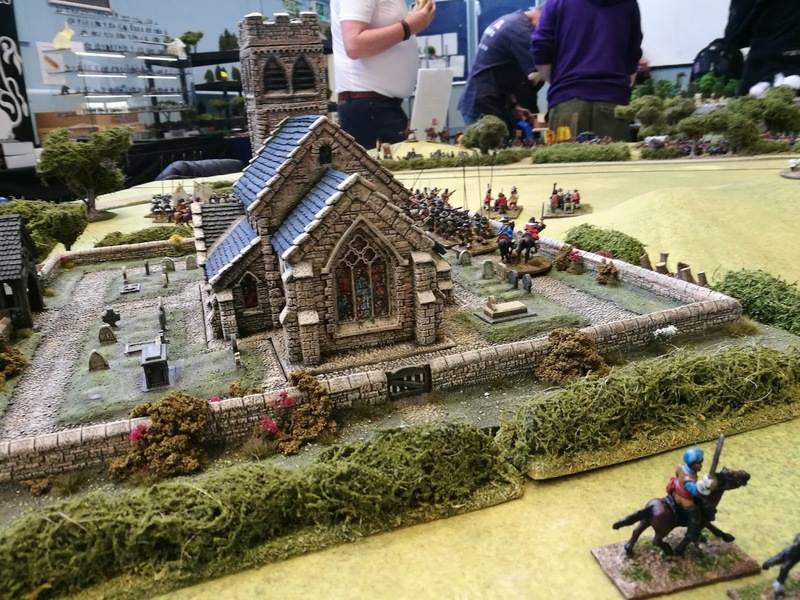 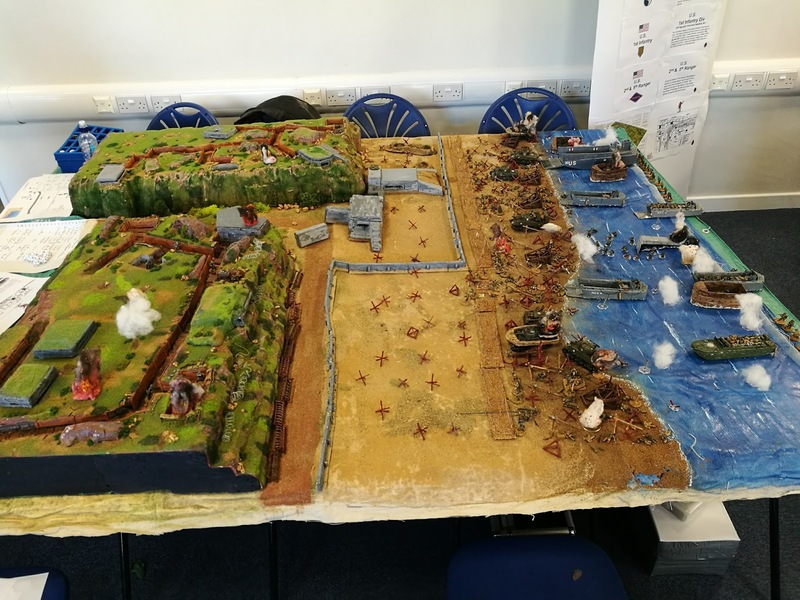 The quality of the games on display was of a high standard and the entries in the painting competition were also very good. 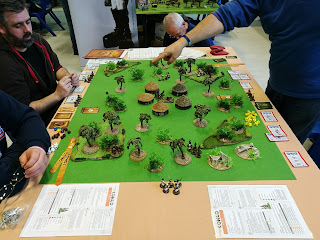 There were a good selection of traders present and I managed to pick up stuff from Crooked Dice, Warbases, Pendraken, Graham's Wuerkshoppe and Dave Thomas. 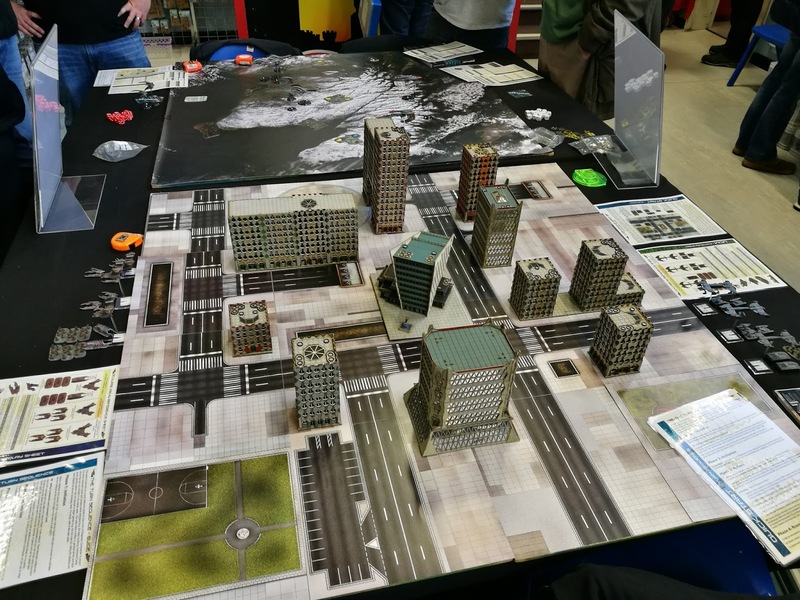 First up we a couple of Dropzone Commander games from the Glasgow Gaming Group. 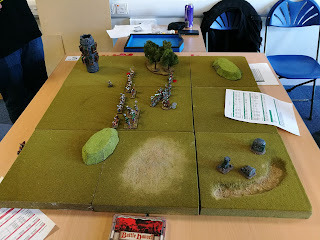 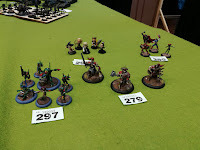 A GW Age of Sigmar game, which only confirmed that I am totally disinterested in the new GW fantasy miniatures. 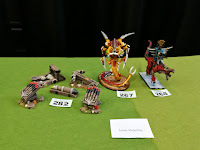 Moving on to the painting competition. I entered my Aliens into the Open category (there is enough there to qualify as an army...). 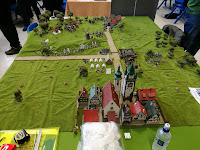 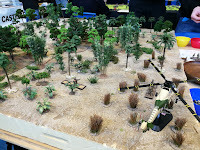 There seemed to be only one other entry, which was a huge and very attractive 6mm army. 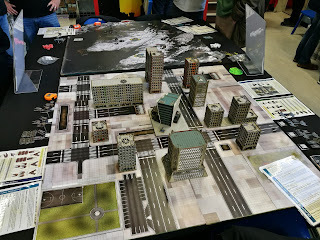 However, I got 2nd place and the winner was apparently a zombie horde, which I missed completely. 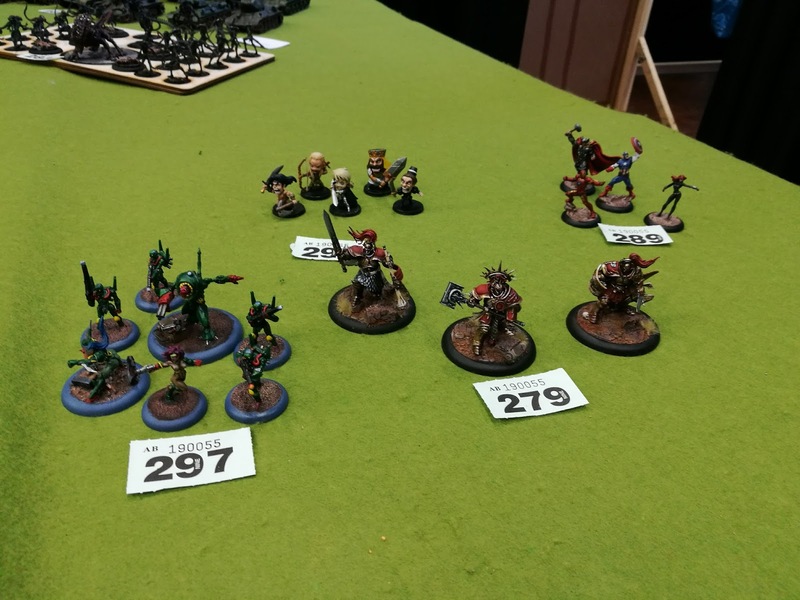 Still, I was very happy with the second place. 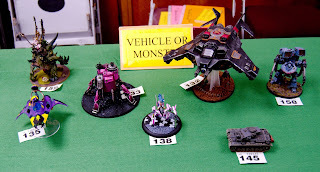 Not really my genre, I am not a big robot, or manga fan, but nicely painted. 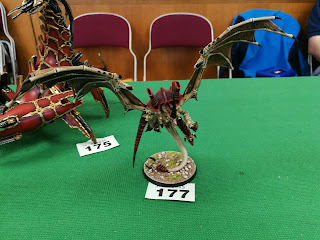 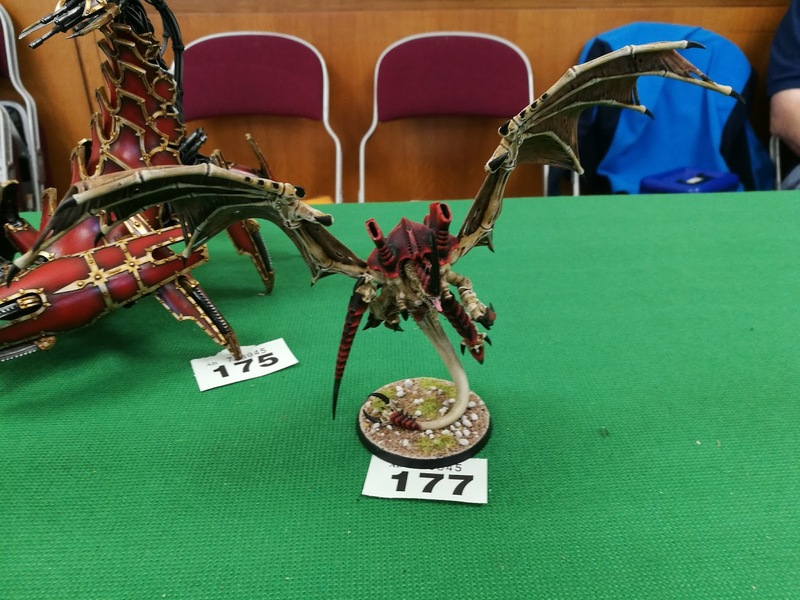 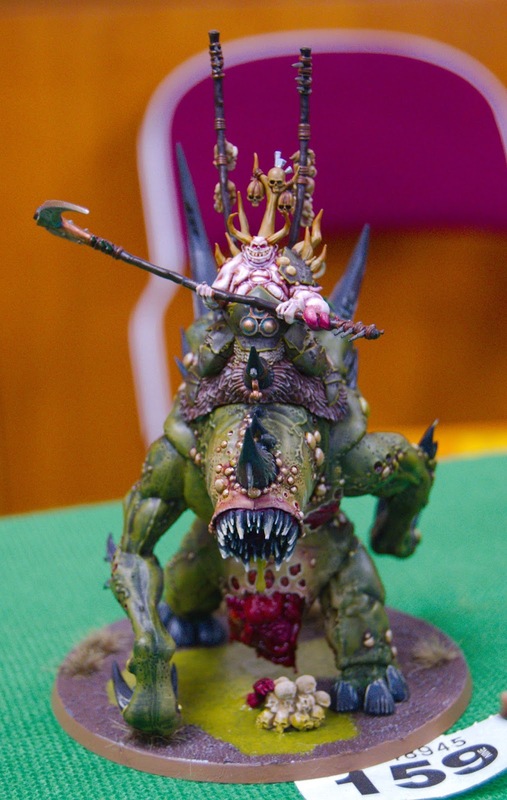 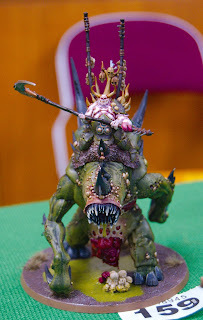 This next monstrous beasty, had a beautiful paint job (if you can describe it as beautiful)! The chipped paint job on this next mech is very effective. I had put my camera away by this point but managed to grab these last two with my phone. Firstly a big Tyranid beast. 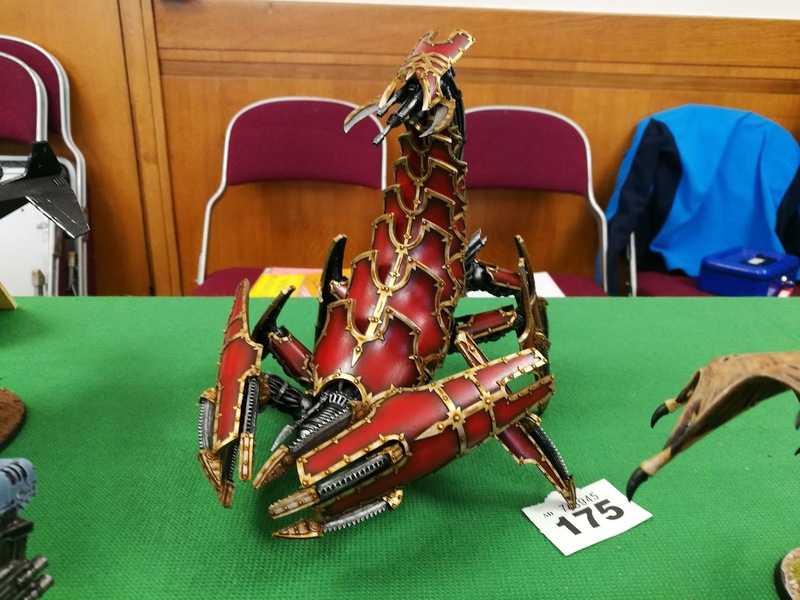 THe final monster/vehicle was this scorpion-like Chaos vehicle. 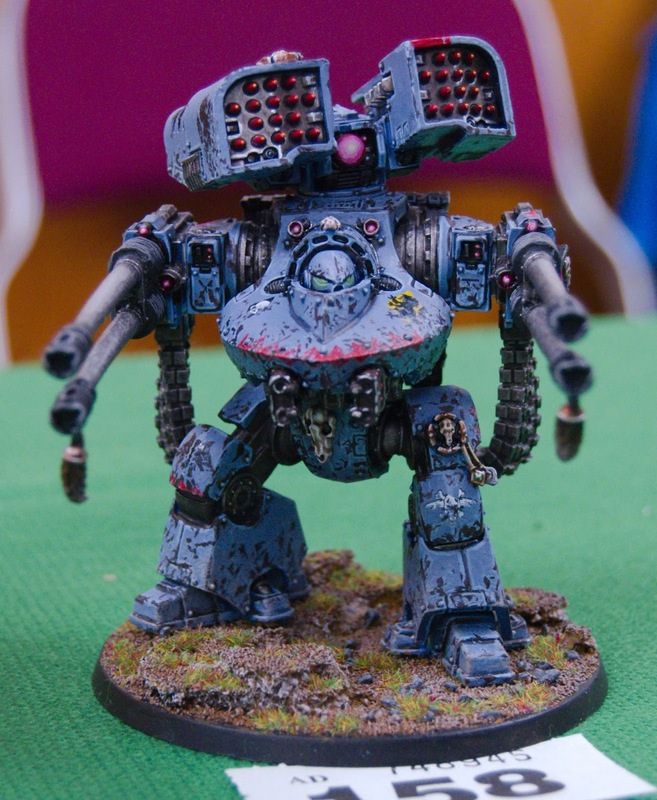 The paint job on this was wonderful, with some excellent blending on the armour plates. 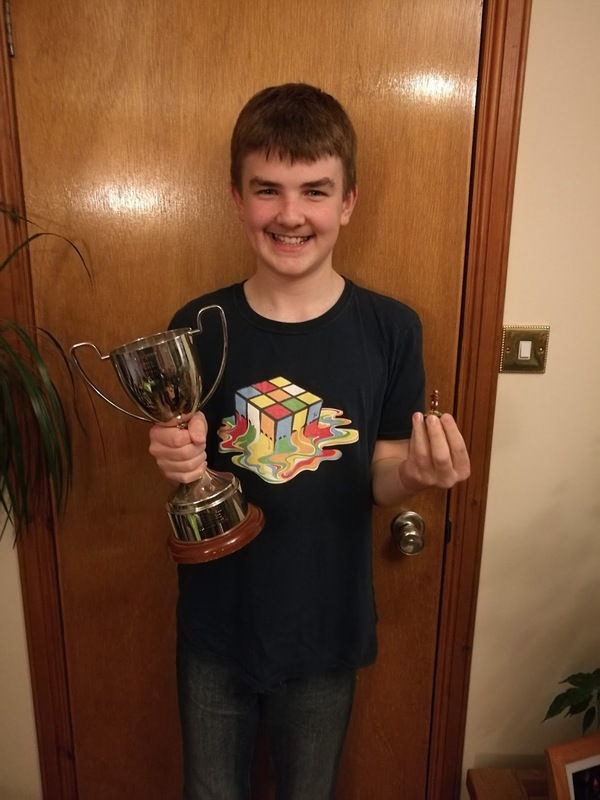 My son entered the Junior painting category with his Hoplite figure from Crossover Miniatures (painted up as Iron Man). 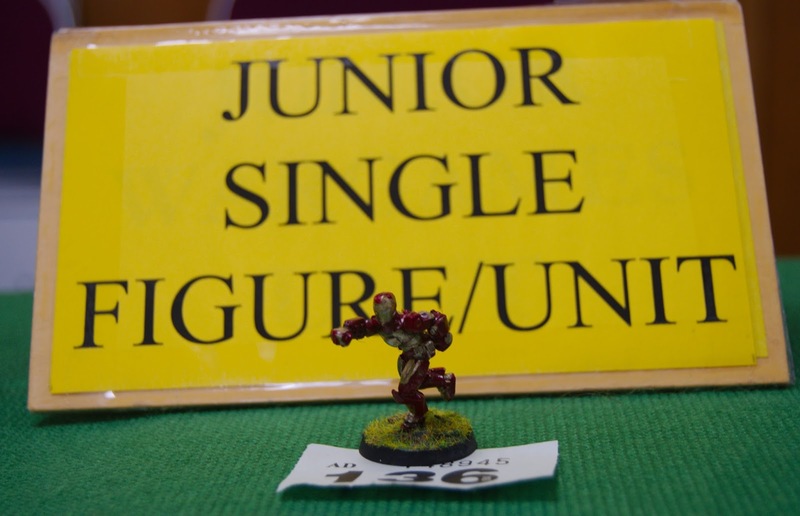 The single figure category was also well supported with some very high standards. 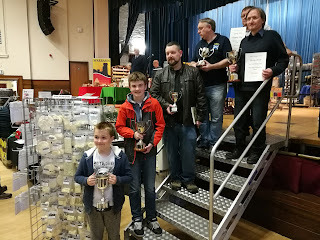 I managed to get this photo of some of the trophy winner (No.1 son, front and centre). Overall we enjoyed the show, although there was a lack of things to do later on, as we had seen all we wanted to by around lunchtime. 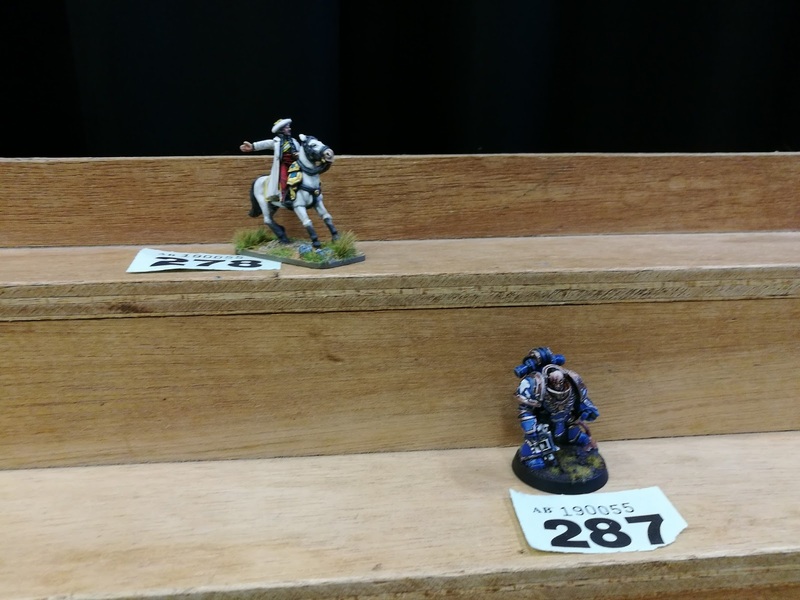 Having to wait around for the raffle and the painting competition results did lead to a little boredom setting in, but it did give us time to chat to a few of the traders.